Kitchen clutter seems to crop up from out of nowhere. Sometimes it can seem like a never-ending task to keep kitchen clutter at bay. However, installing the right kitchen cabinets and cabinet add-ons can be the answer you’re looking for. Check out these eight cabinetry ideas that can help you combat kitchen clutter. Adapt a mail slot mentality for storing slender kitchen items such as baking sheets, serving trays, and large platters. Installing vertical dividers in a cabinet keeps these large, awkward items upright, organized, and easily accessible. Migrate your pots and pans that are jumbled together in a cabinet to a deep drawer that’s sectioned off. You want each pot and pan (with lids on) to have its own section of the drawer where it always “lives” unless in use. Be sure to take into consideration the height of your largest pot with its lid on to ensure that the drawer is deep enough to accommodate it. Dishes are typically stored in cabinets, but they are highly accessible when stacked in drawers. However, they need to be secured to prevent shifting when the drawer is opened or closed. Enter the utilitarian pegboard. Line the bottom of your new dish drawer with a pegboard, then insert tall pegs that will closely surround the dishes to keep them in place. Plus, the pegs can be easily reconfigured if you want to change arrangements or get new dishes. If there’s one cabinet feature that you need to combat kitchen clutter, it’s a lazy susan. The reason why it’s called “lazy” may be lost to history, but this rotating shelving feature is anything but. Install one in an awkward corner cabinet and it turns into a storage powerhouse. Gain valuable floor space by giving your trash and recycling bins a designated tucked away spot. Install a sliding pull-out cabinet that blends seamlessly into your existing kitchen cabinetry, hides your trash, and still enables easy access. While under the sink is a common location for the trash, it can also be inconvenient at times. If someone is using the sink, the trash bin is inaccessible. If you love to cook with spices, then you know that spice bottles can easily become a source of kitchen clutter. The solution is to pick up slanted inserts and place them into a drawer. Then, you can place spice bottles along the inserts with the labels angled up. They’ll be easily accessible when you need them but hidden from view when you don’t. You can further streamline storage by emptying spices into uniform-size containers. This is one of the simpler tips on this list. You can practically double cabinet shelf space by installing hooks on the underside of the shelves. They are perfect for storing mugs, teacups, or anything with handles. Every kitchen needs a designated junk drawer. We’re always going to come across the odd paper clip, rubber band, or pencil. Instead of letting it pile up, place it in the junk drawer. Just be sure to go through it every once in a while, to make sure the clutter doesn’t start creeping back out. 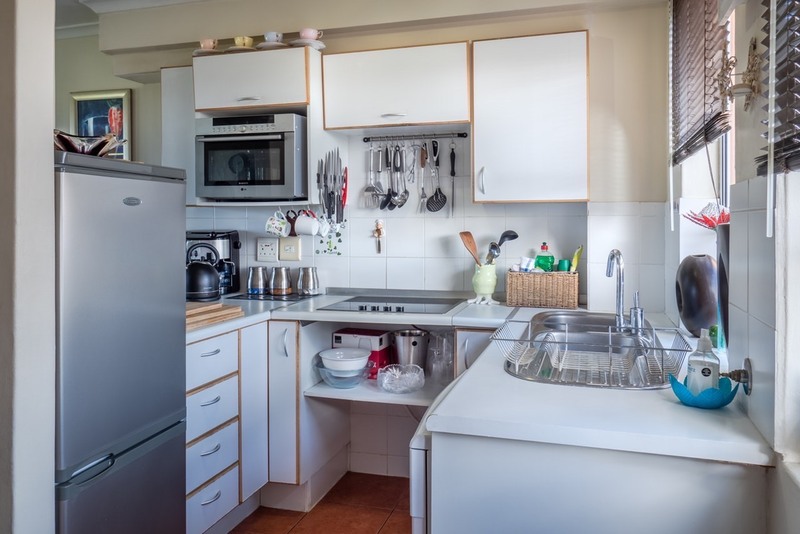 Try out any of these tips above and say goodbye to kitchen clutter once and for all! If your kitchen cabinets need an upgrade, then contact Special Additions, one of the largest and most reputable cabinetry dealers in the New Jersey/New York Area. We’ve been family owned and operated since we opened our doors in 1978.